Glacier National Park is located on the Canada–United States border with the Canadian provinces of Alberta and British Columbia. The park encompasses over one million acres and includes parts of two mountain ranges with over 130 named lakes, more than 1,000 different species of plants, and hundreds of species of animals. This vast pristine ecosystem is the centerpiece of what has been referred to as the "Crown of the Continent Ecosystem." The National Bison Range is administered by the U.S. Fish and Wildlife Service as part of the National Wildlife Refuge System. It was established in 1908 and is one of the oldest Wildlife Refuges in the nation. As its name implies, the Refuge was established to support a population of American bison. It is home to about 350-500 of these animals. Other large wildlife found on the Range include elk, white-tail and mule deer, pronghorn antelope, bighorn sheep and black bear. Because of its open grasslands, the Bison Range is a place for the public to enjoy some excellent wildlife observation and photography. The purpose of the Buddha Garden is to bring about positive transformation within those who visit, in response to the negativity that abounds in the world today. One thousand hand-cast Buddha statues will be arrayed around the central figure of Yum Chenmo, or the Great Mother, the manifestation of the perfection of wisdom. One thousand stupas, representations of the enlightened mind, will line the outer circle. Each will enshrine an image of the female deity, Tara. 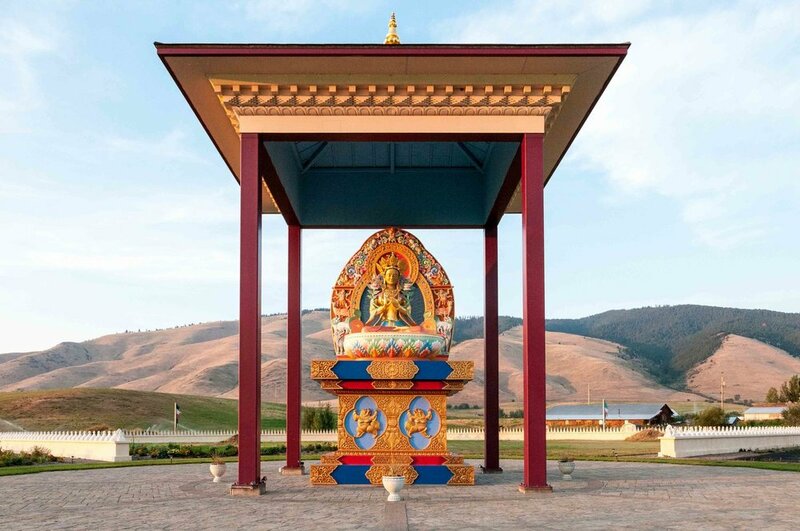 Elegantly adorned with native trees and flowers, it is hoped that the Garden of One Thousand Buddhas will instill lasting impressions of peacefulness and compassion. The Hangin' Art Gallery and Coffee House is committed to community vitality, health and sustainable business practices. The art, handcrafted items, poetry and music celebrate the gifts of the people of Arlee and it's surrounding communities. The choices of food ingredients celebrate the talents of local and regionall farms and businesses. In addition to regular changing exhibits, the Hangin Art Gallery represents a variety of area artists and has their work available on a regular basis. Located on the Jocko River just outside of Arlee, The Jocko River Trout Hatchery is open to visitors seven days a week from 8:30 AM to 4:30 PM. The hatchery produces as many six million eggs during each spawning season, which runs from the second week of October to the last week in December. The hatchery sits on 60 acres of land and includes a hatchery building with an egg incubation area, rearing troughs and concrete rearing tanks.